Lofts on Hulen offers loft-style living with all the advantages. Vaulted ceilings and loft bedrooms create an open and inviting atmosphere. Our one bedroom lofts and two bedroom apartment homes provide more livable space and create an open environment perfect for entertaining. As you browse our selection of floor plans, begin to imagine how great life can be at Lofts on Hulen. When it comes to choosing your next apartment, all the elements are important, from the floor plans and layout of your home to the features inside. At Lofts on Hulen, we’ve created modern one bedroom lofts and trendy two bedroom apartment homes with features and amenities designed just for you. 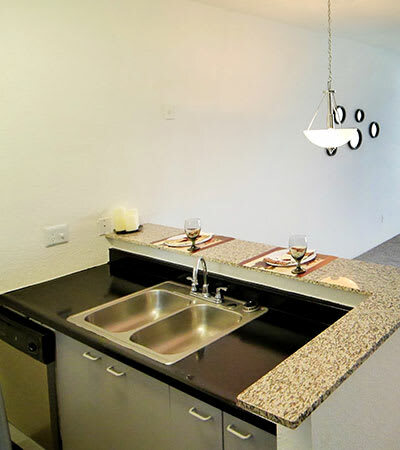 Full kitchens feature stainless-steel energy-efficient appliances and granite bar tops. Air conditioning and fireplaces allow you to maintain the perfect climate in your home year round. Desirable hardwood floors provide an attractive finish for your Southwest Fort Worth apartment and they also make cleaning a breeze. Private patios and balconies extend your living space to the outdoors while walk-in closets give you the space you’ve always wanted in your bedroom. Browse our selection of one bedroom lofts and two bedroom apartment homes in Fort Worth, TX, and contact us to schedule your personal tour today!